Heavy machinery is an essential component to the success, growth and stability within industries such as mining, farming, building and construction and without heavy machinery, the job simply doesn’t get completed. You’ve got more important things to do than call around looking for transporters and, therefore, when you’re looking for a heavy haulage specialist the process needs to be convenient and fast. Find quotes for heavy machinery transport today. Heavy haulage requires skilled operators to ensure that extremely valuable machinery is not damaged and that time is not wasted. So, if you work within these sectors, you’ll understand the crucial need to find transporters who arrive on time, are highly experienced with heavy machinery and who are reliable and dependable. Whether you need to move an excavator, a tractor or a skid steer, you can find a heavy machinery transport company to suit your needs. Get 3 Quotes for heavy machinery transport. It’s free to request quotes. What heavy machinery is moved? Excavators: Excavators range from mini excavators for smaller jobs, to medium and extremely large excavators for the really big jobs. They are one of the most commonly used pieces of machinery on a range of work sites and are utilised across earthmoving, construction, forestry, agriculture and mining sectors. Whether they are wheeled or tracked, excavators are moved on Australian roads every single day and you can find a heavy machinery transport company to move your excavator through metropolitan and regional areas or even interstate. Tractor: When it comes to heavy machinery transport, there is no more commonly moved than the tractor. Tractors can be small or they can be extremely large and they are utilised heavily in farming and agriculture. As all tractors are able to be driven, this makes for easier loading and unloading onto the truck or trailer for the farm machinery transport company. It’s helpful to include the make, model and D.O.M for your tractor to give the farm machinery transport company an idea of the size and ensure you’re getting accurate costs when the transporter calls you with quotes. Backhoe: A backhoe is a popular piece of machinery as it is equipped with the excavator bucket at the back and the tractor-like bucket at the front of the backhoe. They are utilised in earthmoving, agriculture, construction and road works and so there is a regular need to transport this type of heavy machinery. As a backhoe is wheeled and driveable, it can be loaded onto a truck or trailer on a tilt tray or with the aid of loading ramps and this makes the loading and unloading for transit a simpler process. Bulldozer: A tracked bulldozer creates greater challenges for loading than wheeled machinery, however, as the tracked bulldozer is still driveable it can be loaded onto the truck or trailer with loading ramps or the machinery transport company can use a tilt tray truck. If you need a bulldozer moved, add the D.O.M, manufacturer and model so that the heavy machinery transporter knows exactly what type of bulldozer you need transported. Skid Steer: A skid steer can be wheeled or tracked and is utilised in many industries such as construction, farming and earthmoving. The tracks and wheels mean that the skid steer can be loaded with a tilt tray or can be driven onto a truck’s trailer using loading ramps. Skid steers are moved across metropolitan areas and interstate due to site relocations and recent purchases. Wheel Loader: Wheel loaders are used in many industries including farming, forestry and mining and, as a result, they are regularly required to be shifted by carriers throughout Australia. 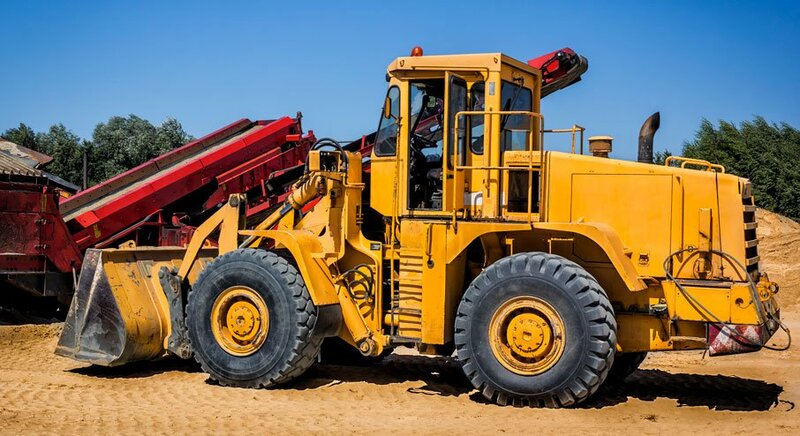 They can range from smaller wheel loaders to extremely large, so it’s important to include the D.O.M, the manufacturer and the model so that the heavy machinery transport company understands the dimensions of your particular wheel loader. Front End Loader: An important piece of earthmoving machinery is the tracked or wheeled front end loader and they are shipped all across Australia intrastate within regional and locally in metropolitan areas, as well as interstate. You’ll need a reliable heavy haulage operator to perform the job for you. Log Skidder: Log skidders go through rough terrain and are heavy duty machinery. As they are driveable, a log skidder can be loaded and unloaded onto a tilt tray rigid truck or trailer or can be driven onto the truck using loading ramps. You can find an ABN verified machinery transport company to move your log skidder. Asphalt Pavers: Whether it’s a tracked or wheeled asphalt paver, it can’t be driven on the roads but as they are regularly utilised in road construction sites they still need to be shift regularly. If you need to get the asphalt paver to a new site or from the depot to the job, you’ll need to find a heavy machinery transport company with the right vehicle and equipment. Directional Drill Machine: A directional drilling machine performs tough work on both farms and on construction sites and, therefore, you need to find a reliable and professional carrier to move them from one location to another. You can find freight quotes for heavy machinery transport. Drill Rig: Tracked and wheeled drilling rigs are most commonly used in the mining industry and they are an essential part of performing many jobs on site. For this reason, finding a dependable and reputable transporter to shift this load is essential. Combine Harvester: When it comes to farming and agriculture, a combine harvester is an essential piece of farm machinery. Utilised for harvesting all across Australia, they are often moved by machinery transport companies due to recent purchases. Log Forwarder: Used in the forestry industry, a log forwarder can be tracked or wheeled and this makes loading and unloading easier. However, as log forwarders can be quite long they may require a semi-trailer in order to ship them. Traxcavator: If you don’t know the exact dimensions of your traxcavator, then you can advise a heavy hauler as to the D.O.M, the manufacturer and the model number. This will assist heavy machinery transporters in determining the dimensions of your particular traxcavator when providing costs. Drott: When it comes to earthmoving, a drott is an important piece of machinery. As a drott is tracked, it is a fairly simple task for a machinery transport company to load and unloading onto a truck or truck’s trailer for relocation. Underground Tool Carrier: As an underground tool carrier has wheels, it is able to be driven onto a truck or trailer’s tilt tray or even loaded onto the flatbed trailer using loading ramps. This makes loading and unloading by the machinery movers at the mining site simpler. Compactor/Drum Roller: Whether you need a double or a single drum roller relocated anywhere throughout Australia, you can find heavy machinery transport companies who do interstate, regional and runs through metropolitan areas. Trenching Machine: A track trencher is a large piece of machinery and with the trencher boom and chain, it needs to be handled by an experienced and skilled heavy haulage expert to ensure that it is not damaged during transit. Wheel Tractor-Scraper: The tractor-scraper is a heavy and extremely long piece of earthmoving machinery and the length changes the type of truck or trailer required to carry this type of freight. Log Harvester: The height of a log harvester can be quite tall on account of the boom and this means that height restrictions for the heavy machinery transporter’s vehicle must be taken into account. This can often mean that a drop deck trailer will be required. Asphalt Profilers: Both track and wheeled asphalt profilers are relocated across Australia between construction sites and due to recent purchases that are delivered to sites. Whether it’s interstate, within regional areas or simply across metropolitan areas, you need to find the right heavy machinery transport company to carry the freight. Pad Foot Roller: A pad foot roller requires a tilt tray truck or trailer in order for it to be loaded and unloading. A loading ramp can also be used as long as it doesn’t only accommodate four wheeled machinery and the ramp is equipped to load the single roller. Multi Tyre Roller: The multi tyre roller is not as large as some of the other types of machinery but it still requires shipping from construction site to construction site and the services of a specialised heavy haulage operator. Underground Mining Loader: An essential part of any mining operation, the underground mining loader is heavy duty machinery and needs to be handled by heavy machinery transporters experienced in moving mining machinery. Water Cart: Water carts used in the mining industry are extremely large machinery. For this reason, it is often necessary to find a heavy hauler with a semi-trailer to ensure that the truck has adequate space to fit the mining water cart. Asphalt Reclaimers: Asphalt or road reclaimers are used to stabilise damaged or worn roadways and, therefore, are utilised in road works on a daily basis across Australia. As they are wheeled and drivable, they can be unloaded and loaded using a tilt tray or a truck’s trailer fit with a loading ramp by a skilled and experienced machinery transport company. Pug Mill System: Whether you need to relocate a stationary pugmill, skid mounted pugmill or a portable pugmill, you’ll need to find a reliable heavy machinery transport company to ensure the pugmill system is delivered safely. Underground Drill Rig: Utilised in the mining industry, underground drill rigs are moved from mining site to mining site and this becomes a big job due to the size of the drill. Finding a transporter who has experience in moving mining machinery becomes critical. If you work in the mining, agricultural, construction, forestry or earthmoving industries, then farm machinery and earthmoving machinery will be an everyday necessity that you simply can’t get the job done without. When you need to relocate that heavy machinery, then you want to find a convenient and simple alternative to calling around to get heavy machinery transport quotes and costs. With FreightQuotes, you can submit a quote request through our free online portal and we’ll send your request to the farm and earthmoving machinery transport companies registered with our site. Up to three of these heavy machinery transporters who offer heavy haulage services will then contact you directly with a quote and costs. It’s the easiest way to get quotes for heavy machinery freight and there’s no obligation to hire if you’re just looking for an idea on rates. It’s a simple, fast and convenient way to shift your load. Heavy machinery transport is available Australia wide. This includes interstate, regional and metropolitan machinery freight covering all states and capital cities including Adelaide, Brisbane, Perth, Darwin, Melbourne, Canberra, Hobart and Sydney. Need transport for heavy equipment or a forklift? You can find transport quotes and costs for all types of freight with FreightQuotes.